Chinook Special Forces helicopter operations in Iraq and Afghanistan. This beautiful and powerful portrayal provides a rare glimpse into the dark world of Special Forces helicopter operations. 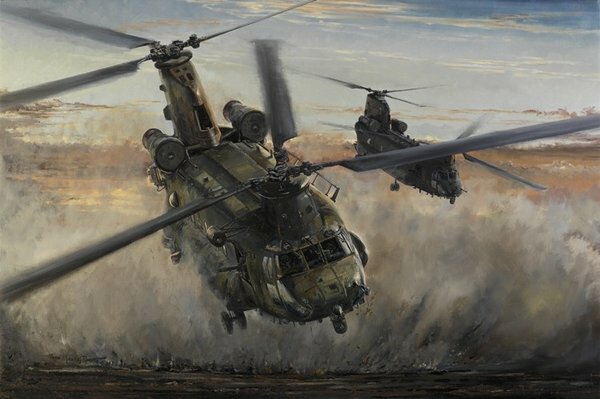 By Day, By Night portrays a pair of No.7 Squadron Chinooks in action on take-off in the typical desert conditions faced by crews during operations in Afghanistan and Iraq. Flying often at night, far behind enemy lines and in extreme weather conditions, No.7 Squadron's crews are frequently called upon to test the limits of their aircraft's performance envelope. Little is known about these operations and much of their flying is shrouded in the secrecy surrounding Special Forces, but the numerous honours and awards for gallantry which are quietly gazetted from time-to-time give some clues about the dangerous nature of No.7 Squadron's duties. Signatures: Artist’s Proofs, Publisher Proofs and Remarques are signed by some of the most distinguished and decorated aircrew in the RAF: Air Chief Marshal Sir Brian Burridge KCB CBE ADC Group Captain Simon Falla DSO Group Captain Sean Reynolds OBE DFC Group Captain John Burr DFC Wing Commander Dom Toriati MBE and other members of No.7 Squadron whose names cannot be listed here for security reasons.